Before jumping straight into my father’s wise message to The African Boss community, I would like to introduce his article and let you know what to expect on your entrepreneurial journey regarding relationships and entrepreneurship in the next five paragraphs. When starting something new or creating a new lifestyle, you will rarely see eye to eye on everything with family, friends and most other relationships. These people love you but because human nature is to stay safe doing what appears to have been working for you in the past, they might not be supportive of your new lifestyle. These sudden life change often gets people around you to worry due to the lack of understanding that this new life is a stepping stone to your ultimate life goals. So if you are feeling the lack of support, it is up to you to help them understand that this is your new reality and that is good for your future. Seven months ago, I started The African Boss and my family and friends did not understand where my business was going to lead me. When I look back, I also realize that I myself didn’t know where I was headed because since then a lot has changed and The African Boss has evolved. But in the midst of all that, I realized that if I could convince businesses and entrepreneurs I do not know to work with me and trust the results I provide with my services, how wasn’t I able to do so with the people closest to me? So I started working closely with my own family and I present to you what my father, Protogene Nsengumuremyi, wrote for The African Boss. This might be something you might be familiar with as an entrepreneur or just as a person who is starting to pursue their dreams in life. A story of support and relationships in business. The African Boss is a unique business-oriented and opportunist Executive. In the beginning, I had doubts on how he was going to start a successful business with no large capital and was worried about the future of his company. Business success requires someone willing to take risks. If you aim to get higher returns or profits, you inevitably will have to higher risks. Yet does that mean, business investments have to always be large sums of money? Usually, you have to spend money to make money. Tahir Shah states “Money spent on good-quality gear is always money well spent” because smart investment yields high returns. So when my son decided to start a business by investing less than $200, I was worried about the future of the company. But in time, as I started understanding his vision, I realized he was very resourceful in knowledge and vision. This knowledge paired with a great business strategy, persistence and an innovative mindset sold me on his idea and proved to work. In the first issue of The African Boss Magazine, stories of all who, from near and far, supported the idea, the vision, and mission of The African Boss company were published. The African Boss journey is very inspirational. The business world is full of untold stories and secrets. As Ray Goforth said, “There are two types of people who will tell you that you cannot make a difference in this world: those who are afraid to try and those who are afraid you will succeed.” Most of the time you will realize that successful people do what unsuccessful people are not willing to do. 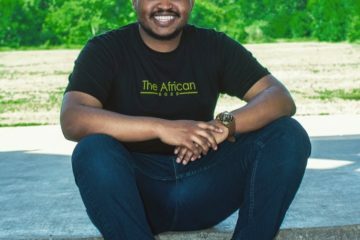 While in primary school, one day Leandre Nsengumuremyi, brother of The African Boss CEO, was discussing with his brother about their hard school activities and they were complaining about waking up too early, working for hours on homework and I told them “You did not come in this world to only do easy things and have an easy life.” They were speechless but gave it a thought. The African Boss CEO is currently implementing this lifestyle of hardships with his brother and more people who support his vision. We all have an innate drive to want to do more and we all can. At any stage of our lives, we always pursue more success and happiness. Tony Robbins once said “there is a powerful driving force inside every human being that, once unleashed, can make any vision, dream, or desire a reality.” And John D. Rockefeller Jr once stated “the secret of success is to do the common thing uncommonly well”. The African Boss is on track to a brighter future. He will ascend into the skies of the wealthiest men because he is proving himself as a hard worker and good manager. He is convinced that in order to succeed, the first and most important thing is believing that we can make it. What are you doing in order to achieve more out of life and live the life of your dreams? What is the story of how you got where you are today and what are your next steps towards achieving your ultimate life goals? Who in your surrounding is determined to help you achieve success and supports you every single step of the way? Leave your thoughts in the comments and subscribe for upcoming articles about businesses and entrepreneurs shared through The African Boss Media. We also welcome businesses and entrepreneurs’ stories so if you would like to share, please set up a time to meet with us. Learn about The African Boss mission in this short 30s video below.